In a large pot of boiling, salted water, cook the linguine until almost done, about 12 minutes. Drain. In a medium saucepan, combine the broth, sherry, soy sauce, ginger, scallions, and salt. Bring to a simmer and continue simmering, covered, for 5 minutes. Add the mushrooms and the salmon to the broth and simmer, covered, until the fish is just cooked through, about 6 minutes for a 3/4-inch-thick fillet. Remove the salmon from the broth. Stir the pasta, spinach, and bean sprouts into the broth. Cover and simmer until the pasta is done, about 3 minutes. Put the linguine and vegetables into serving bowls. Top with the salmon and ladle the ginger broth over the top. 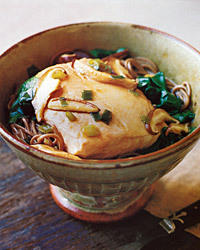 Fish Alternatives The sherry, soy sauce, and ginger in the broth would also complement meaty tuna steaks. Try them instead of the salmon. A full-bodied but acidic white wine will be well-suited to the deep, earthy flavors of the whole-wheat noodles, salmon, and mushrooms. Tokay Pinot Gris from the Alsace in France or Sémillon from Washington State are both good examples.